We are so proud and excited to have been introduced to the technology breakthroughs of biophysicist Dan Winter. If you aren’t familiar with Dan, he and his inventions are (in our opinion) helping to move humanity forward to new levels of understanding and innovation. Specifically, in the area of water purification, Dan has developed The Imploder, which utilizes biophysics principles to purify water sources. The imploder, or SuperImploder technology, for those with more than a passing interest in biophysics, make use of “phase conjugate dielectric” physics and “centripetal implosive capacitance” to alter the molecular structure of water to return it to a purer state. Here, we provide links and information to Dan Winter and his Implosion Group and what it is doing for water purification — for residential and commercial purposes, plus we now sell and ship them direct to you. Before we go any further, we wanted to say that until we get our “Buy a Water Imploder” product page up and running, you can contact us to get the water imploders of different types (Imploder, SuperImploder, and Triploder), designed for slightly different applications. When structuring water using implosion physics, you increase the electrical capacitance and transmission of the water molecule, which means your cells will receive far greater hydration, your plants and garden will receive the same (we can attest to that, having used Dan’s triploder model on a backyard spigot), and you will also get greater and better hydration for less water usage. Farmers and commercial food growers, this is a wonderful choice to increase your yields. But, anyone with any interest in optimizing their water purification will benefit from Golden Mean phase-conjugate implosive capacitance. Water purification using a triploder, one of Dan Winter’s implosion group models. 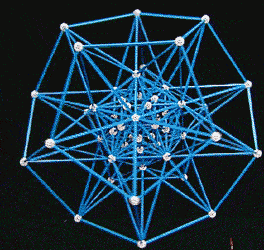 The physics of implosion creates a dodecahedral structure of water molecules, optimizing water purification. *Dan Winter’s extended new equation for the structure of the hydrogen atom: goldenmean.info/goldenproof – Planck Length x precise exponents of golden ratio = multiple hydrogen radii, shown in this article to be the precise wave mechanism of golden ratio implosive collapse / phase conjugation / fusion – would account for why ‘fractal’ hydrogen is the central bond of water, the ‘zipper’ ensouling DNA codon center bond, and solar fusion. It has always been self-evident that virtually every living structure, leaf symmetry and the pent geometry of almost every living protein, uses the golden ratio for an electrical reason. Golden Ratio defines beauty in general for reasons which are also fundamental to physics. It is also self-evident, by inspection, that golden ratio solves the problem of recursive wave interference because it is the only solution to both adding and multiplying (recursive wave interference precisely turns recursive wave addition into multiplication). The authors present their new evidence of the golden ratio structure of hydrogen as one more evidence of the fundamental solution it poses to constructive wave interference, which IS constructive compression. Earlier they noted software emulation which showed golden ratio as the general solution to constructive interference. Here they show the wave-equation-mathematics proof. The first set shows golden ratio is the solution to constructive compression (implosion / fusion) in a line. Then they show how that precise line of golden ratio points extends out each axis of symmetry of the pent dodeca which is the proven shape of hydrogen, DNA, Earth Grid, and the UNIVERSE. Further, a model is presented for how this golden ratio causes gravity electrically: As a portion of the inertia encounters recursive constructive wave interference by golden ratio, in addition to the wave lengths, the wave phase velocities are hypothesized to heterodyne constructively recursively. This way of turning compression into (charge) acceleration is hypothesized to be the core wave mechanism of phase conjugation (apparent self-organization) and the centripetal forces of gravity, life force, color, and perception. in translation underway and scheduled to be released on Implosion Groups: spanish, french, german, italian , polish, czech, portuguese, dutch web sites. And, to wit: Prime Example- Restoring Biologic Negentropy -USING THE PRINCIPLE: Fractal Plasma Time Reversal Field Tech- Prototype soon Ready! Implosion Group Australia team has released this new book.. A PRIORE Device-. Their latest functioning prototype: The Priore Plasma Field as was documented by the French Government- for curing cancer and thousands of serious diseases: (pdfs: fractalfield.com ) Dan Winter’s equations now explain the pure phase conjugate principle behind Priore- and his partners are completing (or have completed) the very exciting prototype: Actual biologic living plasma induced time reversal field technology! Plasma conjugate light and magnetics- all based precisely on the frequencies and phase conjugate technology described in FRACTAL SPACE TIME! 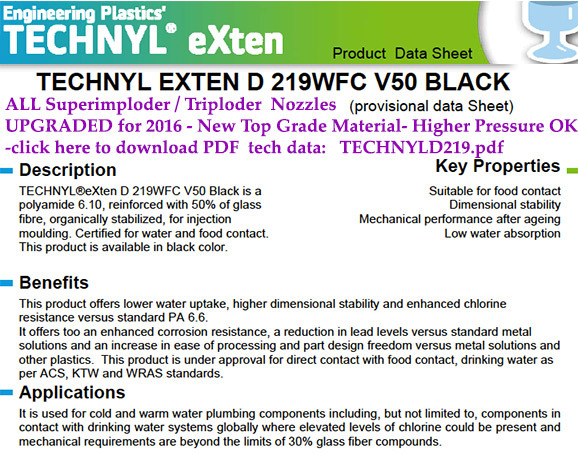 2nd study confirms: Superimploder treated water reduces power required for hydrolysis by 15-20%. (In 2013-western Canada truck-mounted trial achieved the same benefit). 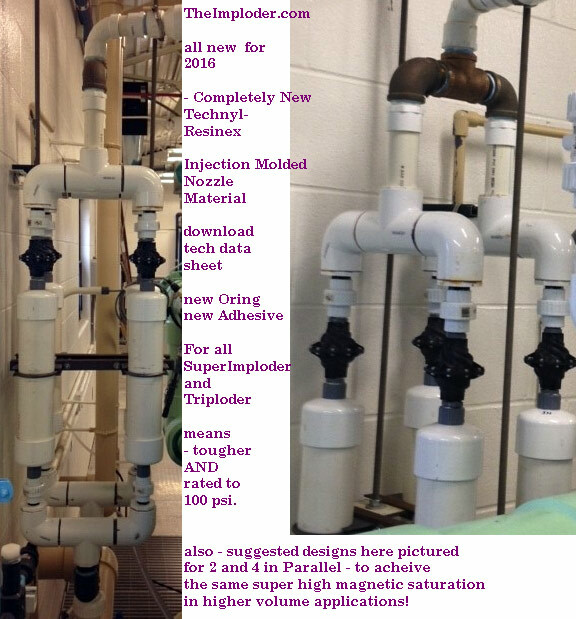 July 2015- Thanks to Pato G. Fractal Innovation- Santiago Chile- detailed report: SuperImploder structuring tap water (mixed with potassium hydroxide to increase electroconductivity for hydrolysis process resulted in 15-20% energy savings in general, when using pressures between 2-4 bar. Here’s a link to the original study: How centripetal force with hydrogen optimizes hydrolysis and water purification: www.fractalfield.com/hydrogen. Note from Dan here: “Clearly what is needed to complete the above model for getting the brain’s MAGnetic worms thru light speed, multiply connected, and time penetrating – is simply the now proven understanding (Greg Hodowanec, Bill Ramsey) that waves of resulting capacitance or charge (gravity – see below) DO travel faster than light speed. And that this push thru the super-luminal is precisely triggered by embedding them in a PHI recursive pine cone. /pineal / pining. ….consider also the possible gravitational effects of charged electrical capacitors after studying the work of the great Micheal Farady the so called father of electricity. It is a little known fact that Faraday made the following profound statement as far back as the late victorian age : ‘Electrical capacity is to gravity as inductance is to magnetism’. …..If Faraday is correct then the energy stored in the capacitor is in the form of a GRAVITATIONAL field much like the magnetic field of an inductor… Townsend Brown also found that the force generated by charged capacitors was directed towards the positive plate; that is to say weight reduction only occurs when the positive plate is upside to the negative plate. …. If the negative plate is above then the device increases in weight. …… the ‘Biefeld-Brown effect‘ in the general study of electrogravitics.” from the article “ParaSETI- ET Contact via Subtle Energies”by Gavin Dingley, Nexus Magazine Dec 2000. Note from Dan: “If only they had realized that it is the arrangement of the capacitive fields into concave vortex like array WHICH OPTIMIZE RECURSION OR EMBEDDING BY PHI RATIO – which FOCUSes THE GRAVITY EFFECT OF CAPACITANCE. “Gravity is capacitance gone fractal”. The result- is the most powerful solubility effect available (reduced molecular cluster size PLUS increased spin density)- energizes ALL biologic growth! Aug 2014- New Report- We are so excited about this! 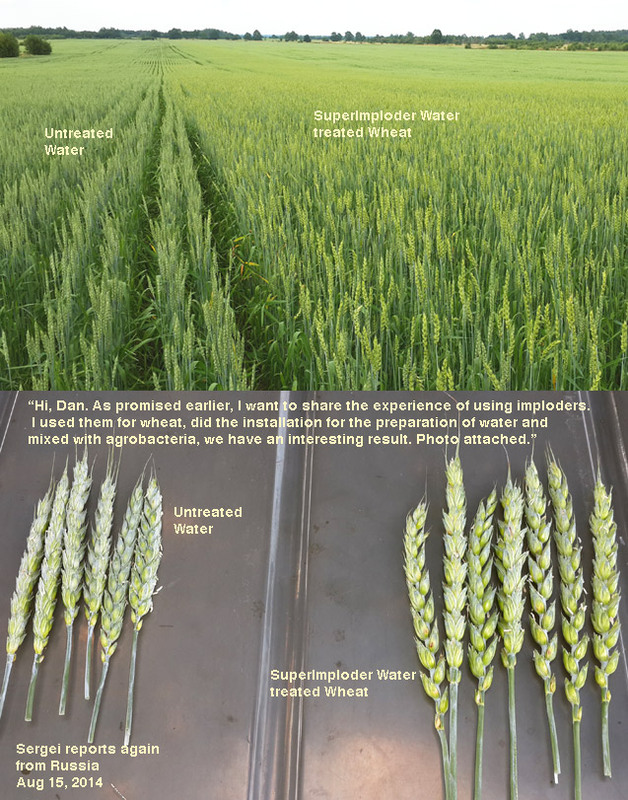 SuperImploder Fractal water is said to provide a higher level of hydration and overall health in crops, animals and people. 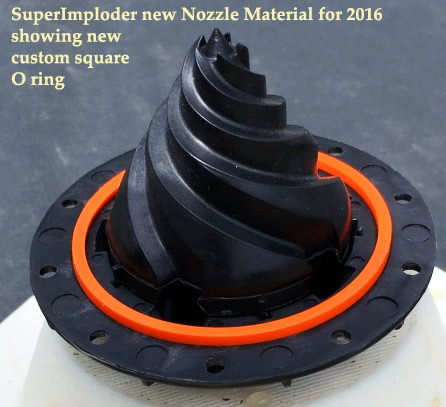 In 2015, GroZine agreed to put the concept to the test with a Vortex Water Imploder. Through their greenhouse hydroponics garden testing, they have observed and documented the profound differences water quality can have on how their plants perform. 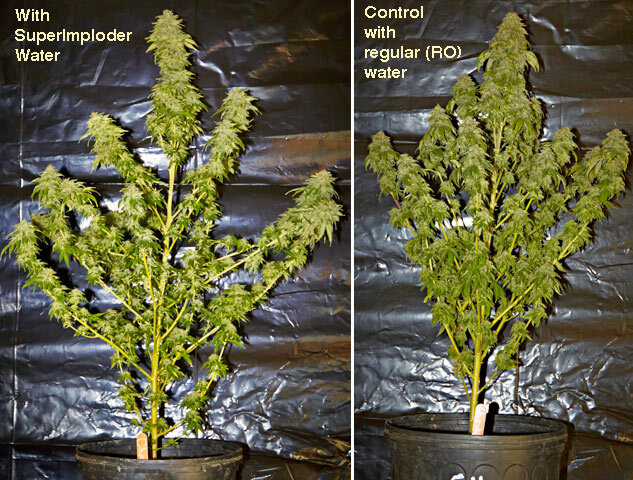 For example, recently they did a side by side Grow Trial in a climate-controlled greenhouse with supplemental lighting and carbon dioxide using a single water source with two different levels of water filtration being used (Hydrologic Stealth Filter and GroGreen Filter) to fill two identical twin RDWC hydroponics systems (Under Current Pro). 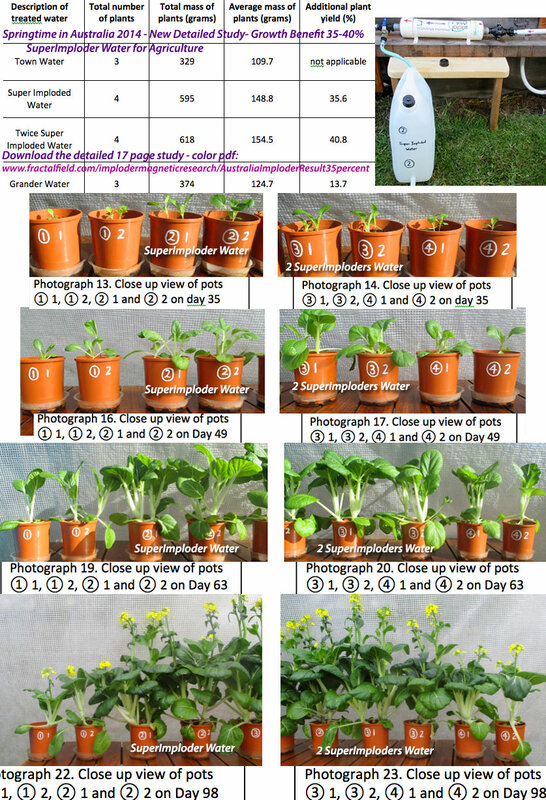 Please review the following link to see the amazing difference in crop health and growth that higher quality water stimulates under real world growing conditions. All other factors in the GroZine controlled test remained equal. 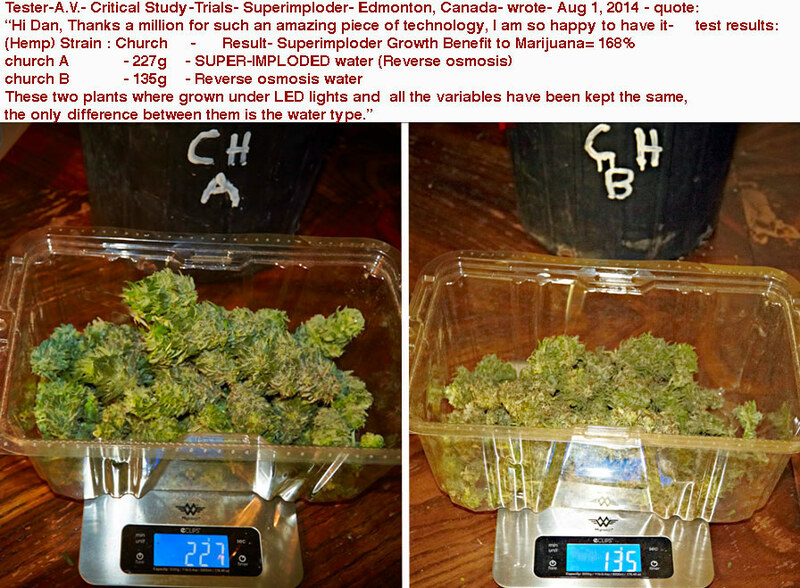 The ONLY difference in the two independent NFT reservoirs, returns and manifolds side by side in their climate controlled greenhouse with supplemental lighting was the fact that the NFT channels with the BLUE stickers on the returns are receiving the re-circulated nutrient solution after it has passed through the Vortex and Imploder in the fractal water arrangement supplied to them. The channel returns with the SILVER stickers are receiving an identical treatment, with the exception that the re-circulated nutrient solution is not passing through a fractal water device as it is being fed to the crops. Get Your Water Purification Optimized with Imploder Technology! You can’t argue with the laws of physics — or even quantum physics. The proof is there, and it’s overwhelming! You can achieve 168% increase in plant growth along with (and because of) the proper restructuring of water molecules from any water source, due to golden mean ratio induction. Look for a future product page featuring all the Dan Winter Imploders, Triploders, and Superimploders for optimum water purification, but in the meantime — you can order them through us, Living Technologies, and start giving your body, backyard, and crop yields the ultra-hydration they need for long life and maximum output!